Modified 2012.03.22: Run spelling check + some other small insignificant changes. 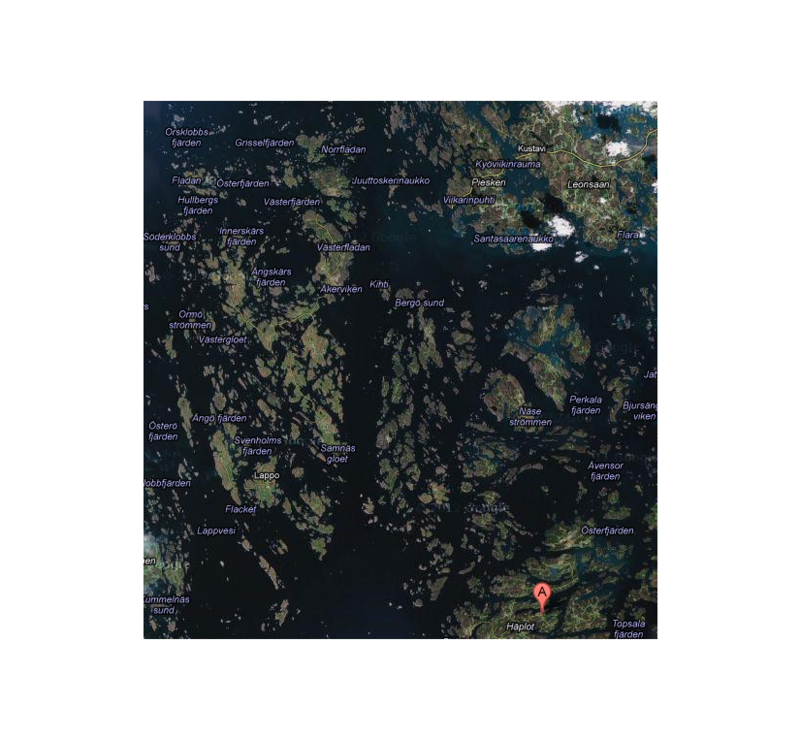 The Mossala and Ava craters are found in the SW archipelago of Finland. Traditionally these craters have been explained as volcanic craters where a magma plume never really reached the surface and later the void created from cooling rock crumbled creating craters. The estimated age is perhaps a billion years. The picture below shows a satellite photography of the area directly stolen from Google (thanks!). I have visited both craters, the Ava crater once and Mossala several times and my personal view is that the age, one billion years or more, can't be correct. 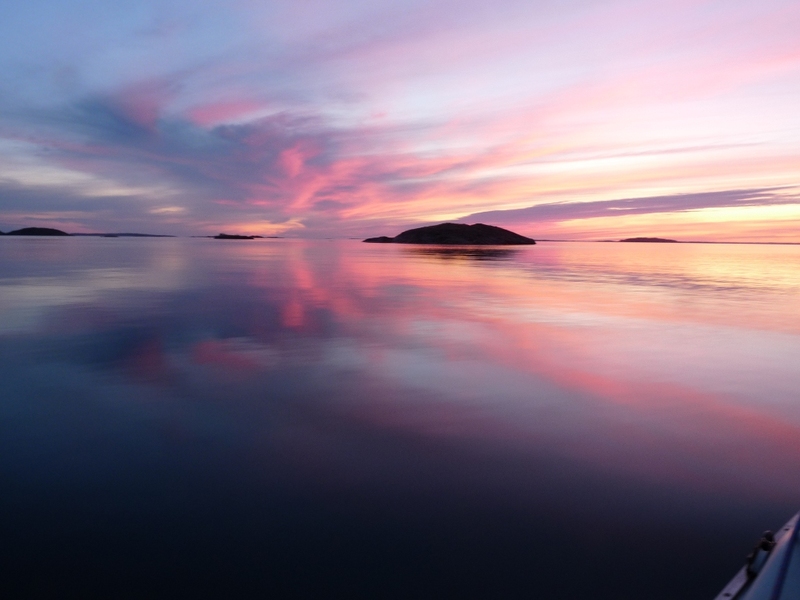 I'm sailing in the archipelago essentially every year. I'll show why I don't think the craters are very old below. Up in NW the smaller Ava crater can be seen and down in SE the bigger Mossala is found. If you want to find he Mossala crater simply search for "Mossala Finland". 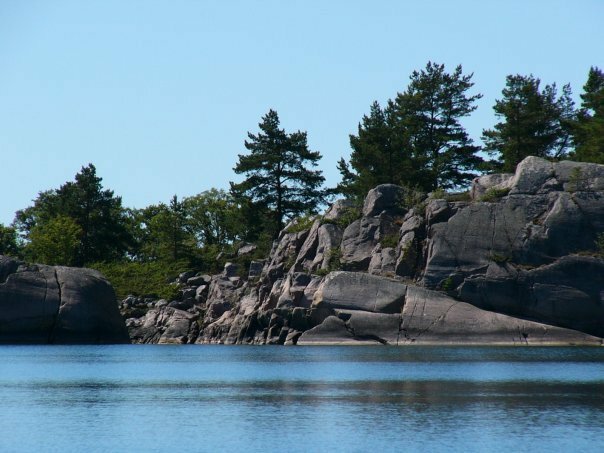 The Mossala fjärd (fjaerd), fjärd is an open stretch of water in the local Swedish language. The size of the Mossala crater is roughly 6 km diameter corresponding to ca. 3.5 nm. Notice the fresh broken surfaces, the same type of broken rock can be found in many places around the crater. My view is that the rock was crushed thousands or ten thousand years ago but it feels strange to believe even one full ice age has polished these surfaces! 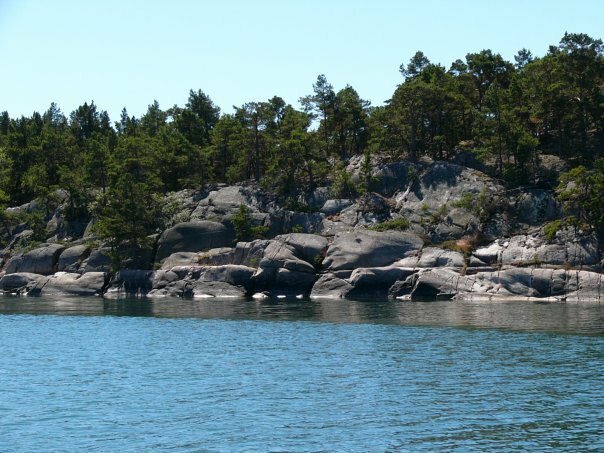 Of course Finnish red Granite weathers very slowly but still this looks too fresh to be even 100 000 years old even more so millions or a billion years old. If there was an sudden impact we should probably find cracks in the rock further avay from the edge of the crater? Notice the almost vertical cracks going very steeply down. Half a nautical mile further away from the edge the vertical cracks disappear and ordinary ice polished unbroken rock is seen. 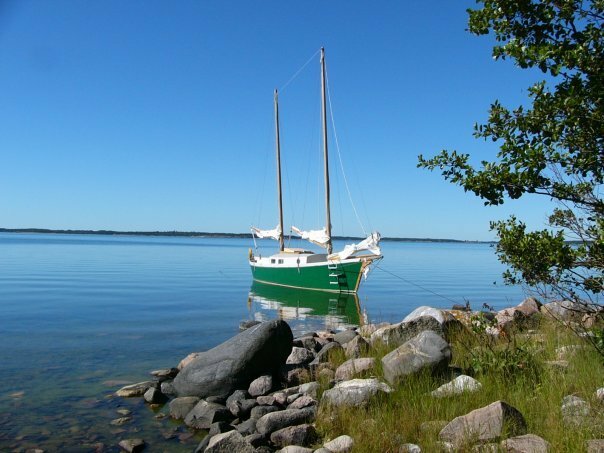 The next picture shows my boat a "Mystic" sharpie designed by Ted Brewer at anchor close to the shore at "Fjärdskaer" the central island in the Mossala crater. The bottom is filled with rubble and even vith a draft of only ca. 2 feet it wasn't possible to reach the shore. The eastern side of the crater looks like this. Again notice the fresh broken surfaces. It doesn't feel possible that these surfaces are older than maximum one ice age. The eastern side, as well as the southern side (not shown), are broken. If there was an impact into thick ice one would expect most of the ejecta to be ice and thus to have disappeared. On the other hand an impact that reaches the bed rock below the ice should also produce ejecta consisting of rock that would land on top of the ice field. These rocks would then be transported by the ice movement in the general direction south. Rocks moved under the ice are very heavily abraded. Rocks moved on top of the ice would be totally un-abraded because they would be deposited gently where the ice happened to melt. 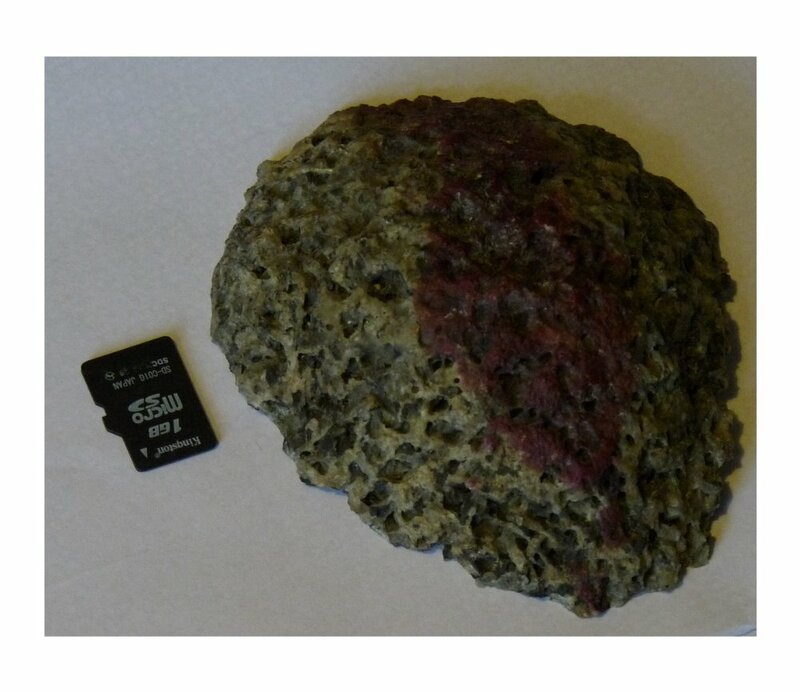 The picture below shows a big rock found ca. 10 km to the south from the Mossala crater. No signs of wear can be seen on this rock. There is no place anywhere close by, say a few kilometers, from which this rock could have broken loose. 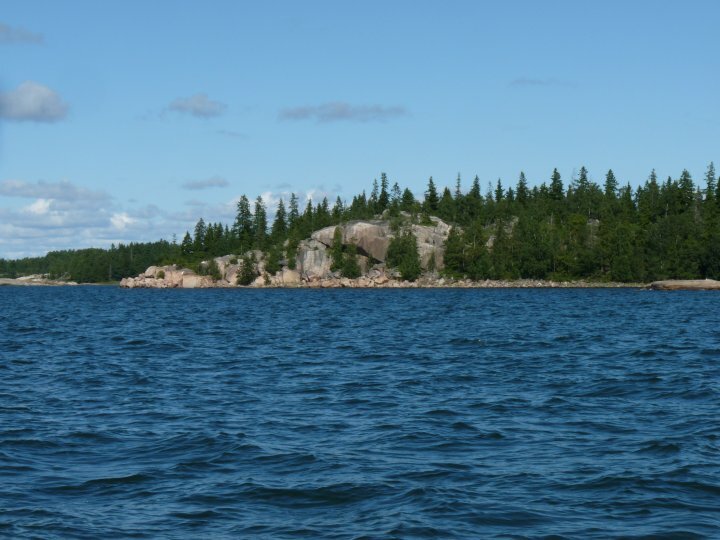 The rocks in the area are of the type seen below the rock that is granite polished by inland ice and later sea ice. How could it be transported here with no signs of wear? My feeling is that this is an example of ejecta from the crater moved on top/in the ice only touching the ground when the ice melted. Of course if this would be the case it would provide means for timing the impact. When digging at his summer cottage at the northern coast of the Korpo island ca. 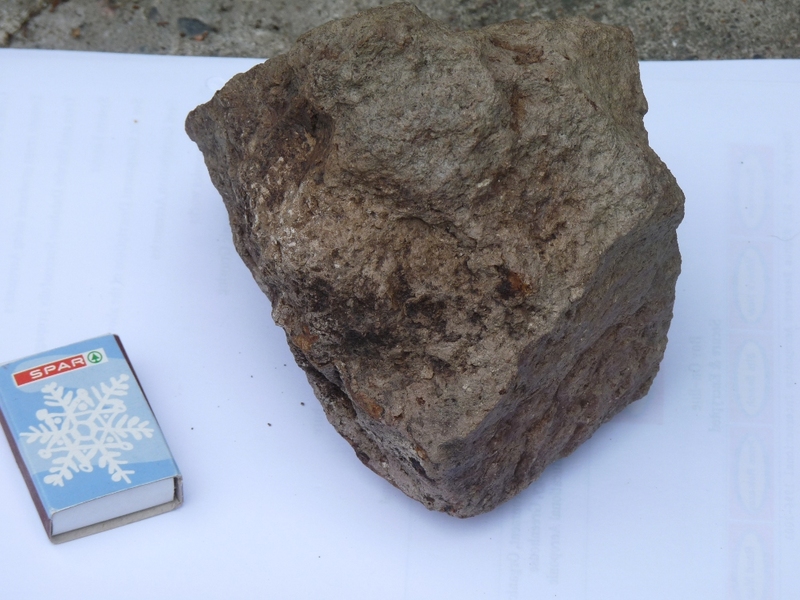 2 km to the west from the main village my cousin found this rock which I think is impact glazed sea bottom. The distance from the Mossala crater is some 15 km almost directly towards the south. Any rubble on top of the inland ice field could have ended up here. The size of the rock is such that it even could have flown directly to the place where it was found. I cut some thin slices from the rock with a diamond cutter and polished the slices. When doing wet polishing one could clearly smell mud. 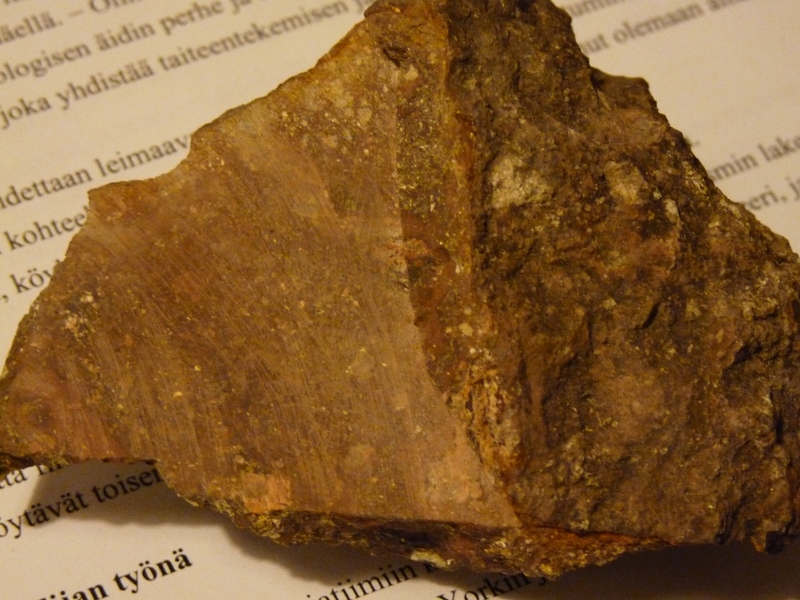 The rock looks very much like glazed mud found at the Siljan impact site in Sweden. The cut rock is the same piece of rock as the previous one but viewed from the opposite side. Look at cut surface which is very similar to the Mien rock shown further on below. Some information about the, much older (I think), Siljan impact site can be found at here. See also an article from Nasa. The impact melt from Mien in Sweden is shown in the picture above. The Mien specimen superficially looks like my specimen that I think is sea bottom due to smell of mud when wet polished. The picture is taken from http://www.impact-structures.com/impact-rocks-impactites/impact-melt-page-impact-melt-rocks-impact-glasses-and-congeners/. The http://cms.impact-structures.com/ is wort visiting for additional examples of impactites and also for general information of impact phenomena. Around the Mossala crater lot's of interesting stones can be found. Below there are two pictures of a stone with very interesting surface structure. The surface has a strange ribbed structure suggesting either chemical leaching of parts of the top layer creating the voids ... or out gassing due to shock heating of the stone. The cut and polished (not very well done due to lack of adequate machines) inside has a strange structure that compared to the outside suggests that the black material disappeared from the surface leaving the white glass like structure behind. 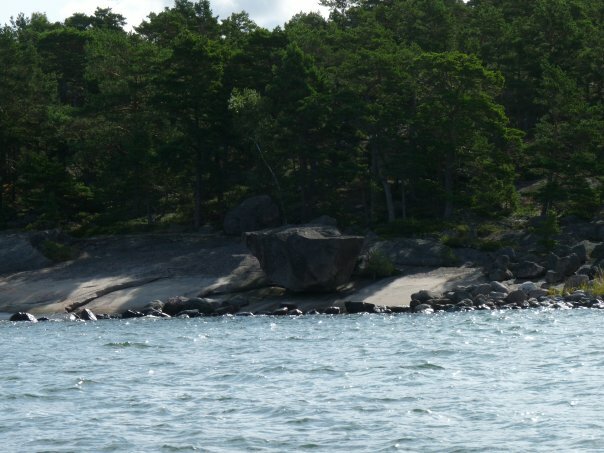 Rocks of this type are very common around the Mossala krater but the can be found occasionally else where in the archipelago too. I have seen some rocks with this structure also close to the main land of the island Korpo. On some places close to Mossala you find a very large number of these rocks. I today (2012.03.21) happened to test the rock above with a strong magnet. The rock is so magnetic that one can lift a Neodymium magnet by the rock. To me this seems to indicate that this rock was a part of the original (iron)meteorite. 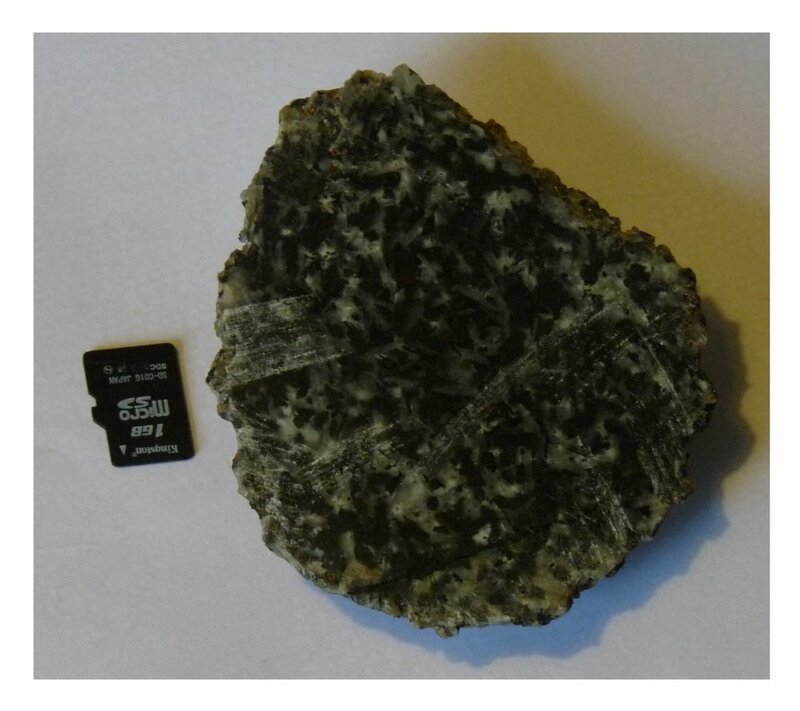 The black crystalline structures seen on the polished side is obviously Iron because it is strongly magnetic. I also today (2012.03.21) looked through my collection of interesting rocks from the Mossala area. 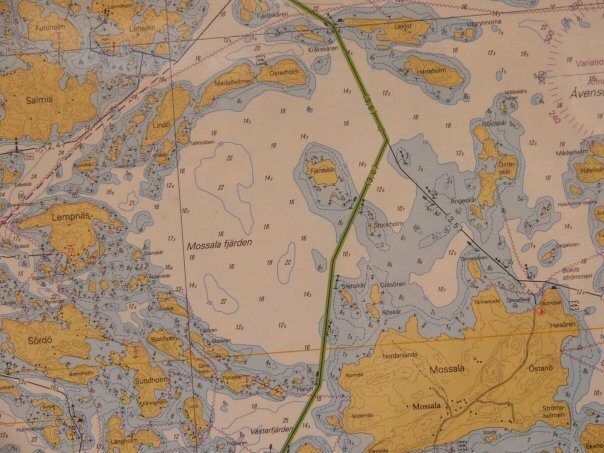 The rock below was found at the beech close to the eastern edge of the crater on Österskär (see map above). I picked it because it looked strange. Again testing it with a magnet showed that it is strongly magnetic. Based on my two specimens and the fact that there is a multitude similar rocks to me indicates that these two specimens are both fragments of the original meteorite with a heavy content of Iron. The smaller one was almost boiling. The bigger one, diameter ca. 100 mm, was burning on the surface causing the iron to disappear and glazing the surface. Notice that this is speculation. I will update this part if/when I find new information. Using the impact calculator one can get a feeling for what the size of the meteorite had to be to create the existing crater. Notice that many guesses are required so only an order of magnitude estimate is possible. The impact speed is at least eleven km/s that is Earth's escape velocity. Asteroids from the inner parts of the solar system tend to move with ca. 17 km/s relative to earth. Comets may reach speeds up to 70 km/s. The calculation below is based on the following assumptions. Roughly half the melt remains in the crater, where its average thickness is 2.65 meters ( = 8.68 feet ). If one assumes that the thickness of the ice field is one kilometer and the crater walls are at 45 deg then the projectile above would, I guess, create a crater roughly 6 km in diameter and unknown depth, but fairly shallow, into the bed rock. The projectile begins to breakup at an altitude of 31400 meters = 103000 ft. The projectile reaches the ground in a broken condition. The mass of the projectile strikes the surface at a velocity of 41 km/s = 25.4 miles/s . Energy before atmospheric entry: 5.58 x 10^19 Joules = 13 300 MT. This corresponds to ca 665 000 atomic bombs of the size dropped over Hiroshima at the end of WWII. The average interval between impacts of this size somewhere on Earth during the last 4 billion years is 160 000 years. Notice that if the speed is higher then a smaller projectile is needed. If the impact angle gets very small the crater also gets smaller but generally the angle changes the crater size surprisingly little. If the density of the projectile is small like ordinary rock or ice then a larger projectile is needed. Low density projectiles tend to explode a few kilometers up in the atmosphere like an atomic bomb and no crater is formed. A meteor falling into deep water, depth more than a few kilometers, won't generate a crater. I visited the Ava crater in 2010 together with a friend but due to time constraints and fairly strong winds we didn't have an opportunity to do a thorough check of the area. The picture below shows the, again, broken entrance to the crater area. Again it looks like fairly fresh broken rock but I really don't have enough detailed information to say anything for sure. We tried to have a look at the southern edge of central island in the Ava area but again the bottom was full of broken rocks. My friend Jarmo swam to the shore to have a look but I really don't have anything conclusive to share. I plan to visit this area again during the summer 2012 any takers :) . Jarmo looking at the rock surface at the, slightly offset, central island. Look at the clouds btw. 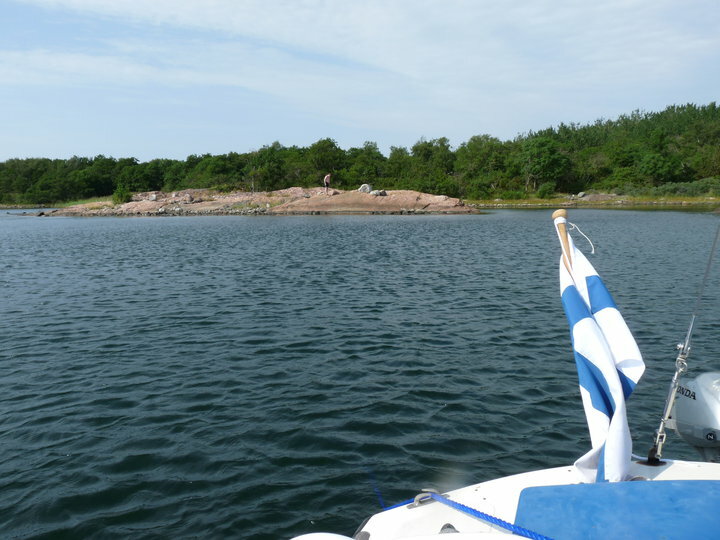 A few hours later we anchored in a fairly sheltered place some ten nautical miles mostly towards the south south of "Samnäs gloet" in the first picture. There was an extremely strong thunderstorm which caused the well anchored boat to move ca. 300 m. The wind was so strong and the place sheltered enough that I told Jarmo that we stay in the cabin, nothing could be done outside in almost complete darkness. The place was sheltered from all sides so no BIG waves were possible meaning that there wasn't any real risk of damage to the boat. The boat was actually shaken quite badly by waves but it was steep chop and not dangerous. When the storm abated we re-anchored without any problems an without damage. The inclinometer in the boat showed that the wind heeled the boat 20 deg with bare poles! Later the same night and the following day fairly heavy damage was reported from the inner parts of Finland. Readers please notice that I don't know for sure if these craters are volcanic in origin or if they are meteorite craters. One big problem is that it looks like very few craters have been found in areas where there has been thick layers of ice. This means that no one, for sure, today is able to say what an impact into a thick ice field would look like. I think it would be very interesting to find measurements of magnetic anomalies in the area. Another very interesting thing to do would be to bore a hole down to perhaps 500 m in the center of the Mossala crater and measure temperatures. I think, without any proofs, that an impact should have left residual heat that one should be able to measure even now if these are recent impact craters. If the craters are old and of volcanic origin no temperature anomalies should be found. If, speculatively, there were one or several big meteorite impacts close to the end of the last glacial roughly some 13000 years ago, what did the surroundings look like? My view is that the area looked much like today's Greenland. The ice sheet above the bed rock was probably ca. 1000 m thick. We can deduce that there was an substantial ice field on top of this area during the ice age because land is still rising in the southern Finland with ca. 30 cm per century (one foot). Further north close to the town of Vasa the land rises about one meter per century. The thickness could have been greater but also slightly smaller. 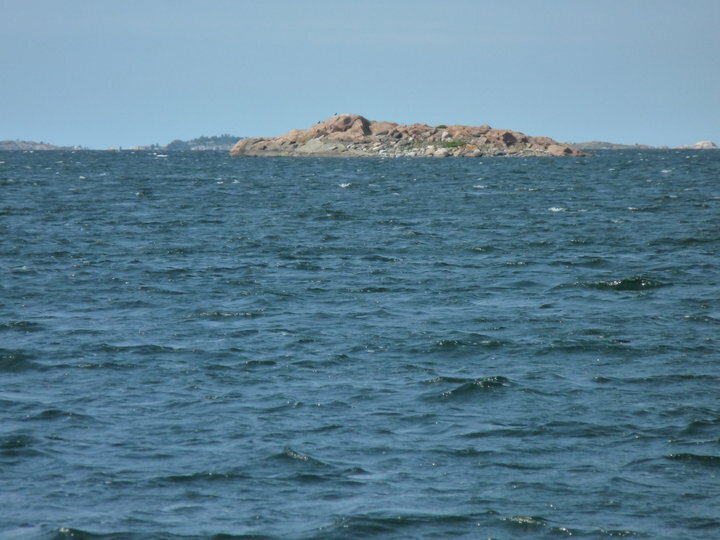 The edge of the ice field was close to today's Jurmo and Utö islands at the southern edge of the archipelago. The bed rock was at a depth of roughly 100 ... 200 m below the sea level at that time. The ice field moved slowly in the general direction SSE. The movement of the ice is easy to show. When the ice moved pieces of rock got stuck to the ice and moved with the ice at the same time working as heavy cutting tools. The scratches created by these rocks are easy to see even today. When one sees the scratches in the bed rock it looks very strange to the huge boulders that have fresh edges (see picture above). Notice a number of thin scratches and really heavy one on the left hand of the picture. The scratches I talk about are the ones go from top left to bottom right. The fact that the thin scratches still are visible after some 10000 years shows that the rock weathers extremely slowly. On the other hand the scratches show that moving ice and rubble abrades rock quite roughly. If there are clear fracture surfaces then a full ice age probably didn't pass the broken rocks. I call the material above breccia because several different structures have clearly melted together. I don't have a clue about the age of the structure. There are obvious ice age scratches on the surface which indicates that the ice moved over the surface since it was born. If it was created through a shock wave while in compression under 1 km of ice it could perhaps be fairly recent otherwise it could be as old as the bed rock >1000 Million years. The picture above again shows some kind of breccia but is it young or old? A picture of breccia very close to a distinct border. At my feet undisturbed rock starts. In front of me there are inclusions in the rock and clear indications that the rock was in melted state at some stage. Again the same question: Are we looking at something that happened a billion years ago deep in the earth or do we see the result of a shock melting and fast cooling. The undisturbed surface could be explained through a big load of "water rock = ice" on top of the bed rock. Nothing actually moved we had a flash heating and fast cooling in situ. The last picture doesn't really belong to this story. One year earlier we brought the small "Karlskrona Viggen" sailing boat built in 1964 from the Stockholm archipelago. This is the boat used for the trip to Ava. The last few hours of that journey was really fantastic. Just enough wind to fill the sails, no waves and only occasionally sounds from birds. Fantastic sailing! The picture is taken south of Korpo and ca 20 nautical miles south of the Mossala crater and the general direction is towards North. Remember that this is really far towards the north (60 deg N) and only a few weeks before it was midsummer when the sun sets in the night but it only momentarily dips below the horizon. There is light all through the night. Enjoy! Sailing towards the North in the Turku archipelago around 10.30 pm. In spite of very little wind the speed was almost two knots. Unbelievable! You are visitor number: since 13 of Mars 2012.